Waste-Away Group : Running Out Of Space For Landfills? Americans' use of landfills peaked in the 1980s when we threw nearly 150 million tons of trash each year into landfills. Even today, we throw away more than 100 million tons of garbage yearly. That translates into landfill space possibly being scarce. In the United States recycling efforts have the ability to divert more than 60 million tons of waste away from landfills yearly, according to Environmental Protection Agency (EPA). That amounts to about 32 percent of all of our garbage. As for the remaining trash, where will we continue to put it? There is a debate between experts as to whether or not we are running out of usable landfill space. Some pay that with the increased number of closed landfills and the increased recycling efforts, we will continue to have ample space for new landfills. Others claim that with the increased population and commercial and residential growth, that we will end up in a space crunch before long. We have plenty of space. That's what some experts say. It is even speculated that we could theoretically give each person on Earth 1/2 acre of land and not run out of space. Considering the amount of trash being recycled and the number of landfills being closed and used for alternate purposes, some don't worry a bit about having enough room for new landfills. It is argued we spend too much time recycling and too much money on the sorting and processing required to recycle those items. Some claim the landfills we have will last for at least another 100 years, but we can always build new ones if they don’t last. Most on this side of the debate claim that living next to a landfill isn't a big deal since most “garbage” is relatively safe. We also hear from this side that new methods of compressing trash and forcing its decomposition helps free up space and that some environmentalists exaggerate the issue. More opinions seem to lie on the side of space for landfills running out and that it's simply a matter of time...a short time. As our economic model seems to suggest, it is unrealistic to expect that we restrict consumption as a means to making landfill space last longer. Existing landfills will eventually reach capacity, and at a more rapid rate than in previous decades. Some states already ship trash across state lines to a neighboring state with more landfill capacity for trash. New York is one state that is notorious for shipping unwanted trash across the state line to another state. No one wants to live next to a landfill but "in landfill-strapped states, the problem is more political than geological or geographical. Landfill operators can build a new site from nearly any piece of land (apart from sensitive ecological areas) in six to eight years. But many voters and bureaucrats in the Northeast, for example, would rather ship their trash across state lines than have a landfill near their homes." 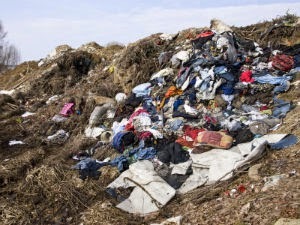 Most feel that home market values would plummet with a landfill nearby. It ranks up there in popularity with prisons and power plants. Lofty proposals have even been made to ship unwanted trash to a remote island or even to space. Realistically these suggestions are implausible and not at all a permanent solution. For more information on solutions for your waste removal visit www.wasteawaygroup.com.